Kon-el, or Conner, was a young clone of both Superman and Lex Luthor. He has most of Superman's powers as well as the power of "tactile telekenisis". He is currently active. 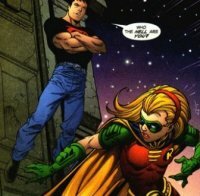 Conner ran into Stephanie when he went to Gotham city to look for Robin who had been absent from the Teen Titans for quite a while, only to find Stephanie has replaced Tim as Robin. Conner is looking for Tim in Gotham City, when he runs into our Girl Wonder, who is having a ball being Robin on the rooftops ("This rocks!"). He asks her rather rudely, "Who the hell are you?" She gives him her codename, and he replies, "No, you're a girl in Robin's costume." Stephanie reiterates her name, and annoyed, shoots a grappling hook to leave. Conner grabs her cape, asking where Tim is, and Steph, very annoyed at this point, denies knowing him. Conner then notes that her voice is familiar (he would recognize it from her brief time with Young Justice presumably). She throws a smoke bomb at the Boy of Steel and jumps to take her leave, but Conner grabs her rope, and after making a remark about the rudeness of "Batman's crew", asks her again where Tim is. She asks him why he doesn't go to Metropolis if he has a problem, and Conner sighs that he can't and that it's complicated, to which Steph gamely replies, "Try me." Later, when Conner finds Tim, he remembers where he heard Steph's voice. "She's your old girlfriend, isn't she? Spoiler, or whatever she called herself?" and Tim replies that he didn't have anything to do with it but "She's a strong young woman. She really is." Kon is still unsatisfied that Tim has quit being Robin, and ninja vanishes in a huff.